We are a Leading Manufacturer, Exporter and Supplier of Brake Motor. We are Manufactering Number of type Brake Motor like Three phase Brake Motor, Single phase Brake Motor, Normally off Type Brake motor, Dual speed brake motor, Worm Geared Brake Motor, Helical Geared brake Motor, Hollow shaft Brake motor, Fail Safe Brake Motor ECT. Thouse all type of Brake motor are avalbel in Foot, Flange and Face Mounted. 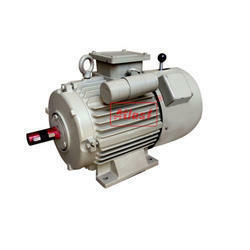 We are manufacturer, exporter, and supplier of Single phase brake motor. Basically Single Brake motor is the combination of brake and Single phase motor. 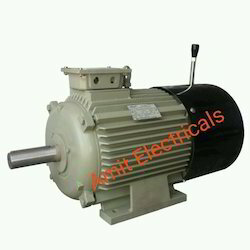 we are leading manufacturer, exporter, and supplier of two type of Single phase brake motor. Fail-safe brake motor in case of power supply off ensuring further to a precise stop and quick braking action, the security of sudden inter venations in case of an unintentional power supply failure (i.e. power supply black-out, equipment failure)The braking action is obtained without axial sliding of shaft and provides equal braking torque in both directions of rotations. Normally off type brake is a totally different type of break-in compare of failsafe. it works when supply on. It helps to stop the machine when need to stop. Like when need to machine or equipment in the situation of emergency. Single phase Brake Motor is supplied in a robust, rugged cast iron frame with integral feet. On Request, we can supply motor in the aluminum body up to 100 L frame. All single phase break Motor supply with class F insulation as the standard feature. Also, supply H on request of the customer. Centrifugal switch is hart of Single phase motor. A centrifugally operated automatic Mechanism used in conjunction with split phase and another type of single phase induction motors. Centrifugal cutout switches will open or disconnect the starting winding when the rotor has reached a predetermined speed and reconnect it when the motor speed falls below it. Without such device, the starting winding is susceptible to rapid overheating and subsequent burnout. Capacitor start induction run motors with high starting torques suitable for use in goods lift. Where high lord inertia and frequent starting and stopping involved Resistant start induction run the motor with moderately high starting torques ideally suited for optimum performance in lifting applications. Single Phase Brake Motor are supplied with forward-reverse rotation Suitability. We are making it Connection easy. A customer can do it himself with a normal reverse foreword Switch. We supply motor with Ingress protection 44 as defined in IS: 4691. Motors can be supplied with IP-54 and IP-55 on request. We are manufacturer, exporter, and supplier of brake motor. Basically Brake motor is the combination of brake and motor. we are manufacture, exporter, and supplier of two type of brake motor. All Brake Motor provided with minimum two earthling terminals. One in the terminal box and other at the foot. The rotor is positive locking with Shaft key joint so that cannot move on high Full lord Torque. Shafts are made by En-8 or En-9 material. Rotors are of high-pressure E.C. Grad aluminum die-cast. Every rotor is dynamically balanced. Its make motor low amplitudes of Vibration & noise. All break Motor supply with class F insulation as the standard feature. Also, supply H on request of the customer. Brake Motor is supplied in a robust, rugged cast iron frame with integral feet. On Request, we can supply motor in the aluminum body up to 100 L frame. We are manufacture, exporter and supplier of brake motor. Basically Brake motor is combination of brake and motor. Our clients can avail from us a wide collection of best quality Brake Motors. These products are appreciated for its optimum performance and excellent quality. Raw material for these products sourced from repudiated vendors, the offered motors are well known among the client and can be availed from us in standard sizes according to the requirements of individual. Highly demanded for its special features, this product is offered at budget friendly prices by us. Backed by rich industry exposure, we are highly engaged in offering an extensive range of Crane Duty Brake Motor to the clients. The offered range of motors is made from optimum quality raw material under the assistance of best industry experts. The offered assortment of products is tested against various parameters to follow and maintain the ongoing market trends. We assure timely delivery of our offered products. Crane Duty brake motors are supplies in a robust, rugged cast iron frame with integral feet. On Request we can supply motor in aluminum body up to 100 L frame. Crane Duty brake motor supply with class F insulation as standard feature. Also supply H on request of customer. We are supply Crane Duty brake motor with Ingress protection 44 as defined in IS: 4691. Motors can be supplied with IP-54 and IP-55 on request. 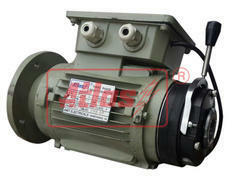 We can also supply Crane Duty brake motor with T.O.P Switch on Demand of Customer. It can provide motor extra safety form over lord protection. Crane Duty brake motor Supply with Terminal box on top position For Foot mounted (B3). Other position box like left or right supply on customer request. All Crane Duty brake motor provided with minimum two earthling terminals. One in the terminal box and other at foot. Crane Duty brake motor is especially suitable to be used with Lifting Machinery, Textile Machinery, Geared motor, Cable Reeling Drums, Rolling Mills, Machine tools Etc. 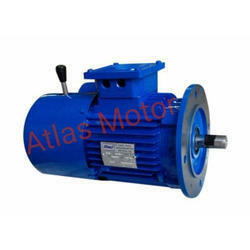 We are manufacture, exporter and supplier of “ATLAS” Make Dual Speed Brake Motor. It Combination of Dual Speed Motor and Brake It Use in many application where machine or Equipment require dual speed with Braking. Fail-safe dual speed brake motor in case of power supply off ensuring further to a precise stop and quick braking action, the security of sudden inter venations in case of an unintentional power supply failure (i.e. power supply black-out, equipment failure)The braking action is obtained without axial sliding of shaft and provides equal braking torque in both directions of rotations. Two Speed Brake Motor is supplied in a robust, rugged cast iron frame with integral feet. On Request, we can supply motor in the aluminum body up to 100 L frame. Dual Speed Brake Motor supply with class F insulation as standard feature Also supply H on request of customer.